A respected bank client sells a luxury condominium in Miami, but the funds flow in through a wire transfer linked to an overseas shell company. Whose job is it to make sure the money is clean? Much of that burden falls on the bank handling the transfer, said Scott Nathan, a Miami-based executive vice president at BankUnited. “My lawyer and accountant friends love to push back a little when [we] are asking pushy questions,” he said. The question, “What does Peter Smith have to do with these overseas companies?” is subsequently left unanswered. But it’s just a matter of time before nonfinancial institutions are required to report suspicious activity on luxury real estate purchases, said David B. Chenkin, managing partner at Zeichner Ellman & Krause in New York. Miami’s luxury housing market fell under federal scrutiny when the Treasury Department’s Financial Crimes Enforcement Network deployed a geographic targeting order to peel back a layer of secrecy on high-end cash deals with no names attached. The GTO, which went into effect March 1, requires title companies to disclose the people behind limited liability companies making cash housing buys worth more than $1 million in Miami-Dade County. The order raised a burning question: Who is responsible for detecting transactions with possible ties to criminal activity? 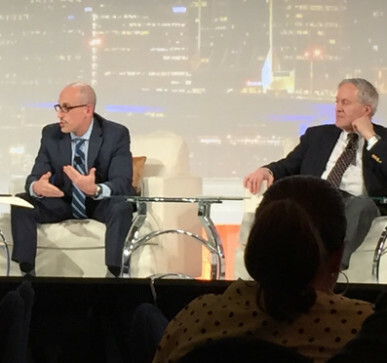 A panel discussion featuring two attorneys, a banker and an accountant tackled the issue of compliance responsibility Wednesday at a Florida International Bankers Association’s anti-money laundering conference. “Folks have realized it’s not just financial institutions that have access to huge amounts of information,” Chenkin said. The GTO requires title companies to report the identity of the person primarily responsible for a large cash purchase along with a driver’s license or other form of identification. If an LLC is involved, the underwriter must provide the name, address and taxpayer identification number of all its members. “While the GTO is one thing, there are a lot of things going on in the background,” Nathan said, illustrating how someone may layer small amounts of laundered money in accounts spread across multiple banks. The pushback from lawyers unwilling or unable to share information about the source of funds often forces banks to file multiple suspicious activity reports, commonly known as SARs. “If the source of the funds is completely unsubstantiated, we return the funds,” he said. But John Moscow said such scrutiny threatens to slow down commerce from abroad. But now, “it’s spilling over to the rest of us,” he said.